Marshmallow Toss - Icebreakers, Icebreaker Ideas, Games, Activities! Toss marshmallows to your teammates as they try to catch as many as possible with their mouth in a set amount of time. This game is best for ages 12 and up. Marshmallow Toss works well for groups of 8 or more people. To set up for the marshmallow toss game you should make lines on the ground to set distance barriers. Use masking tape on a solid surface or plastic cones on a grassy surface. Set the distance so that it’s appropriate for the age group of the people who will be playing the game. They should be able to toss a marshmallow fairly accurately from one line to the other. Separate your group into pairs to compete in the game. Line each pair up so that one player is behind one marked line and the other player is directly across from them behind the other marked line. There are two different ways the game can be played. You can either have one player throwing to the other to see how many they can catch within the time period or else you can have the players alternate throwing back and forth to each other to get the longest streak of catches. Whichever method you choose to play, set your timer for around 1-2 minutes or any other time of your choice. Signal players when you start the timer and allow them to begin playing. At the end of the time, let all the players know that the time has expired and that they should stop throwing marshmallows. Any marshmallows thrown or caught after the time stops should not be counted in the total score for that pair.Tip: After each round of the game, have each player help to clean up the marshmallows that were dropped so that they don’t make a bigger mess later by getting stepped on or squashed around the area. This is where the plastic bags come in handy. Disclaimer: Like all food-oriented games, safety comes first! Be careful of choking hazards. The winner of the game is the pair that either catches the most total marshmallows or else has the longest back and forth streak of catches between one pair. Paper Airplanes (Name Planes Game) - Icebreakers,Ideas, Games, Activities! Spoons - Icebreakers,Ideas, Games, Activities! 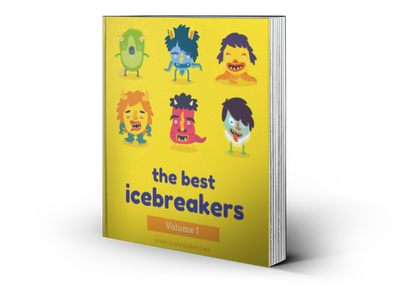 Page Not Found - Icebreakers,Games, Activities! 2019 icebreakers.ws. All rights reserved.